Why does Power BI Preview have an issue creating visualizations for my date table? I have an Azure SQL database with several tables, including a Date dimension (D_Date). 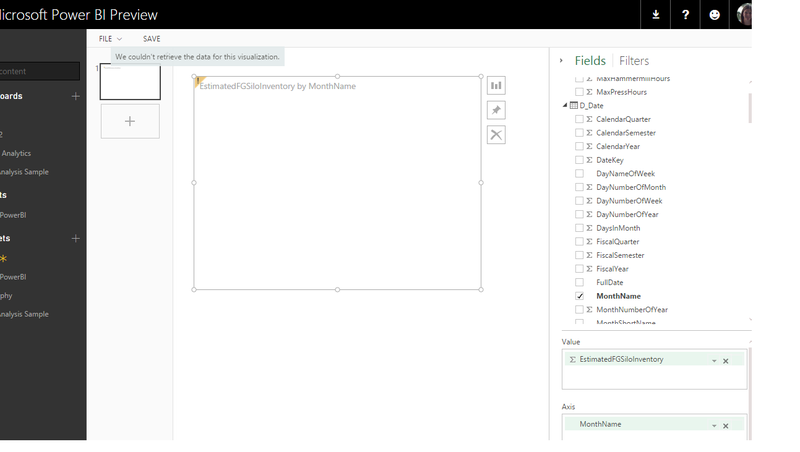 When I connect to it from PowerBI.com and then try to create some simple visualizations, I get the error "We couldn't retrieve the data for this visualization" every time I use a field from D_Date. I have foreign keys set up in the database for relationships and I can successfully use fields from other tables and it recognizes the relationship. Has anyone else gotten this error? I don't know if it has anything to do with my table being a Date table or not. Unlike in Excel, I can't do "Mark as Date table." Got this to work by changing the data type in the database for the FullDate field to be of type DateTime instead of Date. The FullDate field was the unique date field on the date dimension (I also have a date key of type integer). Not sure if this is a bug or what. Not the answer you're looking for? Browse other questions tagged powerbi or ask your own question.